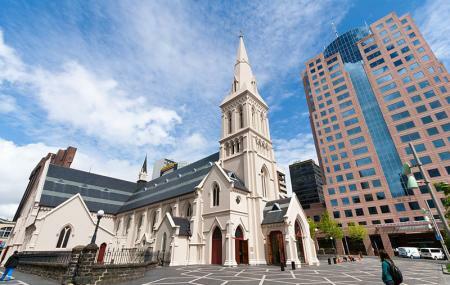 Saint Patrick’s Cathedral is the Mother Church of Auckland diocese. The cathedral offers so much to visitors, not just a place to worship, but also peace, serenity and lovely grounds. This simple, plain church was built of locally quarried hammered scoria and had a very substantial appearance similar to others designed by Walter Robinson at this time. A grapevine outside the cathedral is believed to have come from a vine brought to New Zealand by Bishop Pompallier. Active place of worship. Please maintain the tranquillity of the place. For Mass timings of the Church, refer the official website. How popular is Saint Patrick's Cathedral? People normally club together Auckland Harbour Bridge and Sky Tower while planning their visit to Saint Patrick's Cathedral. Such a beautiful Cathedral 😍 I spent so much time with Anna. She's a wonderful woman and a lovely singer. She generally sits on the bench behind the cathedral and sings. She has a tiny guitar looking musical instrument. Please buy her a drink if you head that way. She'll be very happy 🍹🥛🍹🥛or some lollies. Located in the city centre, very welcoming and open church. The most well attended Christian Cathedral in Auckland. A truly moving service every day. Tremendous congregation. Beautiful respect to a place where worship occurs. Fantastic attendance at their services. Many lessons here for less traditional venues of faith affirmation. Beautiful building which is situated right in the middle of the city.